In today’s world, it is important that data transfer processes occur not only quickly, but securely as well. With Binfer’s secure file sharing technology, there is never a worry that your data will be leaked or end up in the hands of the wrong recipient. Binfer’s secure file sharing software provides complete end-to-end AES 256-bit encryption without using the cloud (or other server). With Binfer, you can be assured ZERO data is stored and ZERO data is sold. Binfer moves your files directly to the receiver’s device ensuring that whatever you are sharing remains private and secure. Security has been one major barrier for organizations when it comes to moving to the cloud. With so many data in the cloud, employers can feel like there is no real secure method of file sharing or storage. Companies will need to find secure alternatives for their employees to share documents that they can deploy at the enterprise level. Without a standardized approach, employees are bound to use a plethora of free vendors, have numerous accounts, which are likely not to be audited or monitored. Companies should advocate for using secure enterprise cloud software. 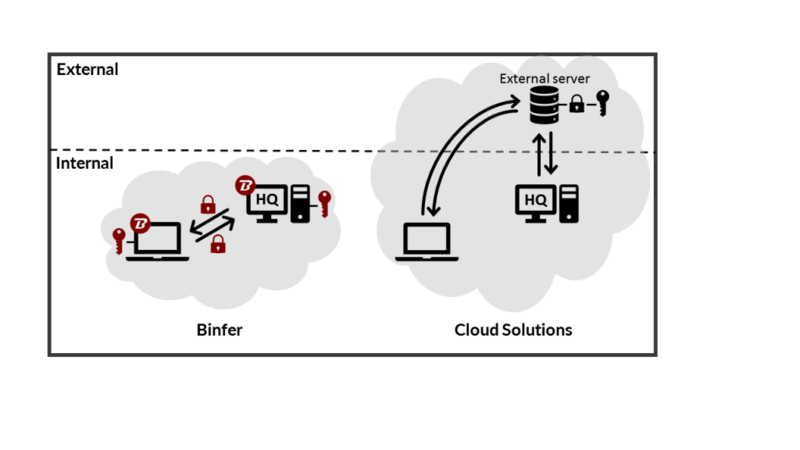 The fact that Binfer never replicates or stores customer’s data eliminates the risk of cloud-based storage hacks and other dangers that are a associated with keeping information stored in one central location. What are the privacy and security policies? How is your data protected? Who has access to the servers? What is the backup and failover policy? How soon will the servers brought up? Where are the backups kept? Who has access to the backups? What to do if someone hacks into the system and obtains your files? Is there data mining on your files? Are you suddenly getting a lot of spam? When you delete files on the servers, what happens to the backups? Are they actually deleted or virtually deleted? Many, if not all, of these issues can be addressed by private and direct file sharing. With direct file sharing, the files are transferred directly between two computers. So, 1) it would be very difficult to intercept and mine your data and 2) only two copies exist; one which was sent and one which was received. Files transfer directly from you to the recipient. No uploads or downloads to any third party servers! Your file transfer are 100% safe and private. Binfer is one of the few solution in the world that can transfer large files of any quantity from computer to computer in a secure way.